In October 2018, the highest number of gender parity cabinets was achieved. Six out of the current ten gender-balanced cabinets were formed in 2018. In January 2014, UN Women and the Inter-parliamentary Union (IPU) reported only three countries with at least 50 percent of women ministers (Nicaragua, Sweden, and Finland). This figure went up to five countries in 2015 (Finland, Cabo Verde, Sweden, France, and Lichtenstein) and to six countries in 2017 (Bulgaria, France, Nicaragua, Sweden, Canada, and Slovenia). The recent appointment of gender-balanced cabinets in Ethiopia and Rwanda brings the list of countries with at least 50 percent of female ministers to ten. In November 2015, Prime Minister Justin Trudeau gave Canada an unprecedented young, ethnically diverse, and gender-balanced government team. In his July 2018 cabinet reshuffle, gender parity stayed intact with a total of 17 women and 17 men ministers. In August 2018, President Iván Duque of Colombia announced his new cabinet, which for the first time in the country’s history included as many women as men. Women head the ministries for justice, interior, labor, and mining and energy among others. In April 2018, President Carlos Alvarado of Costa Rica presented his cabinet, which made national history with the inclusion of 14 women and 11 men and the appointment of Epsy Campbell as the first woman to lead the country's foreign relations. In October 2018, Prime Minister Abiy Ahmed of Ethiopia appointed a cabinet marked by gender parity with ten women and ten men. In May 2017, President Emmanuel Macron of France formed a gender-balanced government with 11 of 22 ministries led by women. In October 2018, he announced a new 34-strong cabinet with 17 women. In October 2018, President Paul Kagame of Rwanda unveiled a new gender-balanced cabinet with 13 women ministers out of a total of 26. In April 2018, President Danny Faure of Seychelles announced a new cabinet comprised of five women and five men ministers in addition to the President and the Vice president. In June 2018, Prime Minister Pedro Sanchez of Spain announced a new cabinet with 11 women ministers and five men. Key ministries such as justice, economy, defense and education are headed by women. Sweden has the world’s first self-proclaimed feminist government. In 2014, Stefan Löfven appointed a cabinet including 12 women and ten men ministers. The global average for women holding ministerial positions is 18.3% (as of January 2017). 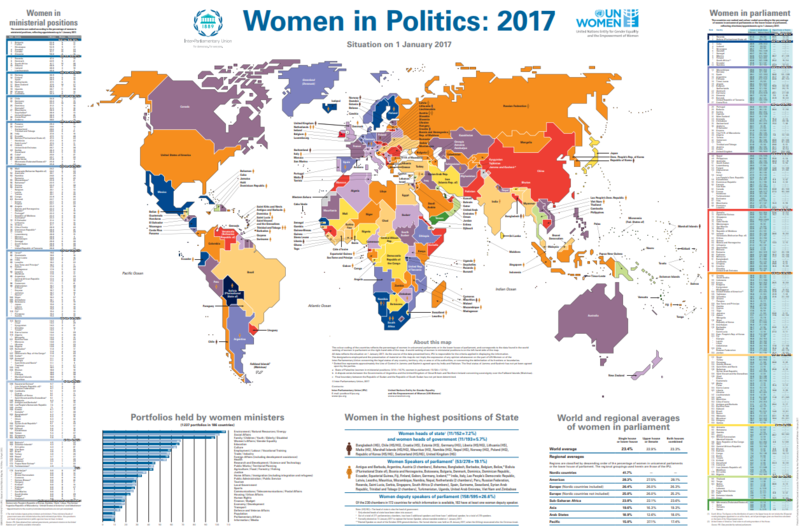 See UN Women and IPU’s 2017 Map on Women in Politics for more information. Did we miss something? Please let us know at connect@iknowpolitics.org.